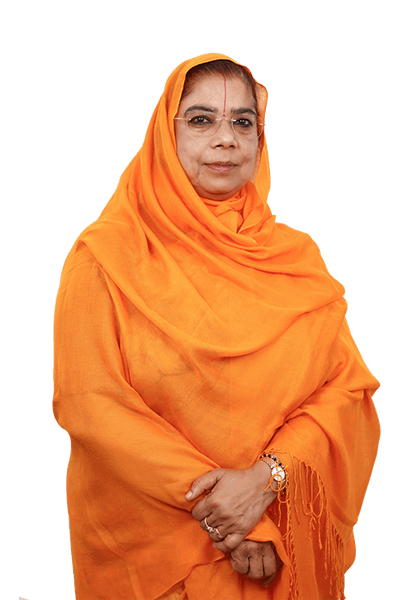 Dr. Vishakha Tripathi Ji is President of Jagadguru Kripalu Parishat and the major philanthropic arms of the organization - Jagadguru Kripalu Parishat Education and Jagadguru Kripalu Chikitsalaya. 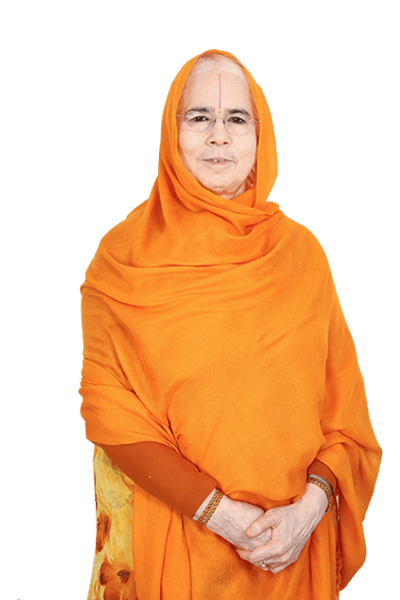 She is a pillar of strength and leadership and remains fully dedicated to the advancement of all the projects started by her Father and the Founder of Jagadguru Kripalu Parishat, Jagadguru Shri Kripalu Ji Maharaj. She works tirelessly everyday to guide almost 2000 volunteers to perform their work enthusiastically. Under her leadership, over 3.5 million people have been benefited by the philanthropic and spiritual work of the organization. Her guidance has led to the establishment of many centers and ashrams around India and the world, with one major objective - to spread the great Philosophy of the Vedas, as set forth by Jagadguruttam. 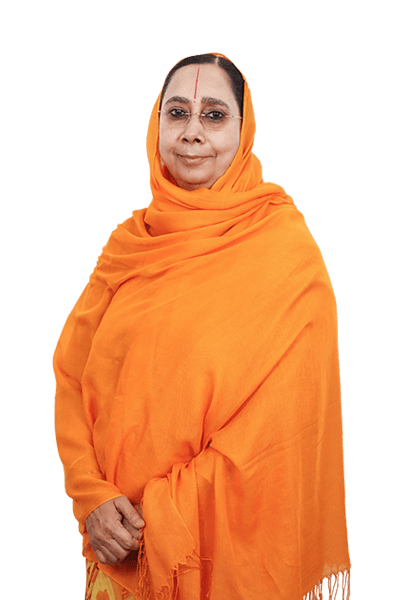 As an eminent scholar with profound knowledge of Jagadguru Kripalu Bhaktiyoga Tattva Darshan and the divine scriptures, Dr. Shyama Tripathi Ji was appointed by Jagadguru Shri Kripalu Ji Maharaj to teach His appointed preachers. She oversees all the publications of all the writings and philosophy as set forth by Jagadguruttam. 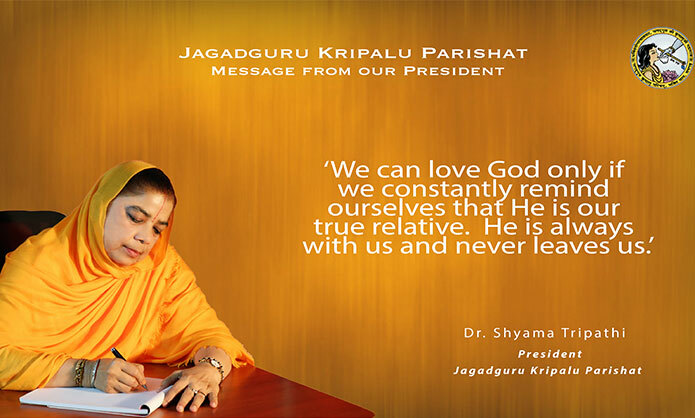 She motivates all the preachers to spread Jagadguruttam's divine message to the entire world. She is an example for all devotees as she embodies the values of discipline and hard work towards reaching the ultimate goal of human birth. 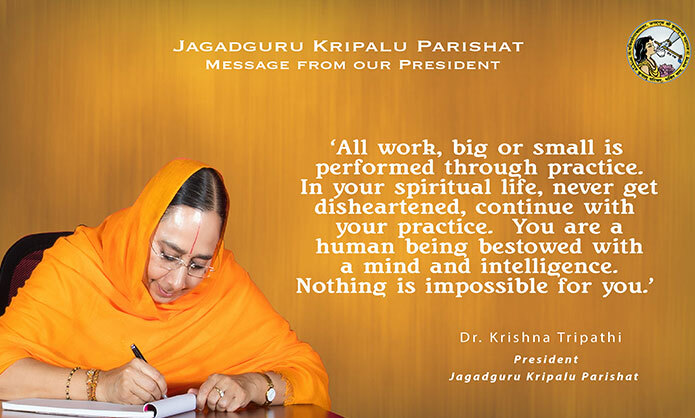 Dr. Krishna Tripathi Ji is an eminent scholar of the divine scriptures and shares the philosophy as set forth by her Father and the founder of Jagadguru Kripalu Parishat, Jagadguru Shri Kripalu Ji Maharaj, to all that come to her with questions. She inspires all Sadhaks to move forward on the spiritual path with hope and vigour. She works everyday to ensure that the organization is running as per Jagadguruttam's mission. Her unique skill in the art of adornment means that she designs all the outstanding dresses of all the deities within the JKP Temples, Prem Mandir, Bhakti Mandir and Kirti Mandir. Human beings of the current age (time) do not heed to the welfare of their own souls. They are becoming more and more restless since they consider themselves to be the physical body and thus, are running after the material world just in order to obtain transient happiness. The organisation has been rendering social services through various social activities performed at a regular basis. 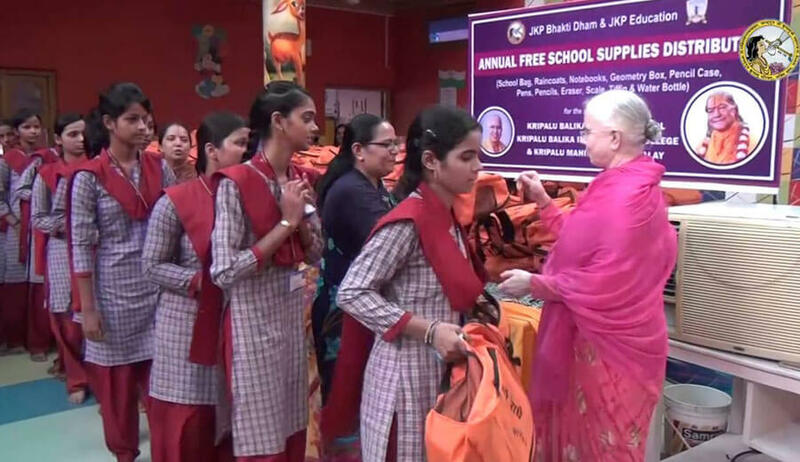 The organisation is endeavouring various praiseworthy works in the fields of medicine, education, and for the welfare of women and upliftment of society at large. Several constructions are being carried out under the auspices of the organisation; a huge sadhna (meditation) hall in Mangarh, a charitable hospital, as well as another grand sadhna hall in Vrindavan, and Kirti Mandir in Barsana. All the construction work are not only going to be beneficial in the future, but also has been providing employment to thousands of local labourers. 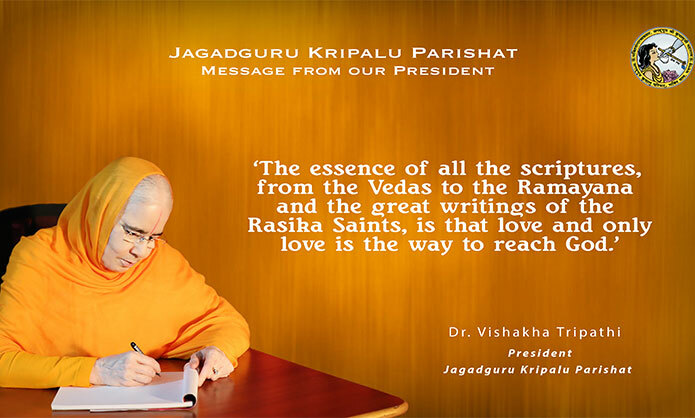 We seek the blessings at the lotus feet of Radha Krishna and our Gurudev Jagadguru Shri Kripalu Ji Maharaj to provide their divine guidance in carrying forward the spiritual and humanitarian works of Jagadguru Kripalu Parishat.